I’ve gone all American on you with the title of this post, Polish Pickles. One lesson I learned from my Polish friends was that pickles are made with vinegar. The preferred method of creating sour little cucumbers in Poland is to preserve them in brine, so these are more correctly referred to a preserved cucumbers rather than pickled cucumbers. If this differs from your family’s English definition of Ogórki Kiszone, I’ll have to refer you to my group of experts in Poznan. I’m just repeating what I’ve been told. 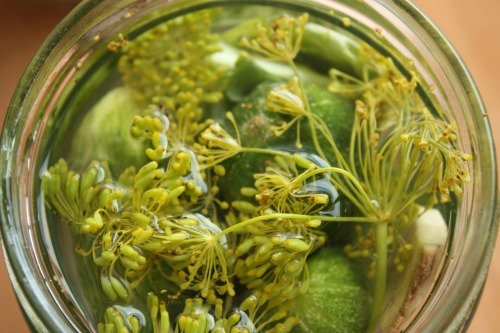 Ogórki Kiszone are much loved, and I was fortunate to be given jars of brine preserved cukes twice. The first jar came from my friend Elzbieta, her mother makes them every year. The second came from a young man, an engineering student at our Poznan’s Politechnika University, and a waiter at our local TGI Fridays. We would chat at Fridays, and occasionally run into each other at a party in our neighborhood. At some point, we got on the subject of Ogórki Kiszone, and the next time I saw him, he brought me a jar of his mother’s preserved cucumbers. Apparently, he had multiple jars stashed in his dorm room. I returned the favor at our next meeting with samples of a few things I’ve been whipping up in the kitchen, almond cookies, and his favorite Bailey’s pinwheels. One of the things I loved about Polish supermarkets (even little markets) was the pack of veggies they’d put together for soup making and in the summer, for your Ogórki Kiszone. I bought one of these when I tried my hand at this Polish staple in Poznan. It included multiple cloves of garlic, a flowering stem of dill, a piece of horseradish root, and leaves. My research tells me that any of the following leaves can be used: cherry, black currant, raspberry, oak, grape, horseradish, mustard. The leaves contain tannin and are supposed to help the cucumbers stay crisp during the fermentation process. That’s what’s happening to produce the sour taste, lacto-fermentation. Laco-fermentation doesn’t involve dairy. Lacto refers to lactic acid. All fruits and vegetables have beneficial bacteria such as Lactobacillus on the surface. In an oxygen-free environment, these bacteria convert sugars into lactic acid, which inhibits harmful bacteria and acts as a preservative. (This is why you want your cucumbers completely submerged, so they’re in an oxygen-free environment.) It’s also what gives fermented foods such as sauerkraut, kambucha, or sourdough bread their characteristic sour flavor. Below you’ll find the basic process for making one quart of Ogórki Kiszone. Other than the cucumbers and salt, you should feel free to adjust, add to (maybe a bit of chili pepper), or omit on the ingredient list and multiply based on the number of quart jars you’d like to make. On your Polish pickle recipe, do you boil the pickles in a water bath? It seems I remember my grandma doing pickles but doing a water bath and that kept them from spoiling. Thanks for the info! My sources don’t use a water bath in canning, but I can imagine it would provide longer shelf life, but you would give up the probiotics benefits. ” water bath ” as in processing? No need for brine cured. But if cucumbers are not picked the same day that you can, they should be soaked in cold water for 2-3 hours, washed, dried and scalded in boiling water. Also, be gentle when washing, you want to keep all those little bumps. They just need to be rinsed. Your not going to fit 8 to 10, 4 inch pickles, in a 1 quart jar, unless maybe you slice then. How long is the shelf life after they have fully fermented? And, should they be refrigerated after fermented? After fermentation has stopped and the lids have been tightened, they can be kept on the shelf for a year. After opening a jar, I would keep in in the fridge, for up to a month. The acidity produced by fermentation, the salt added and the fact that the cukes are submerged in the solution prevent undesired bacteria from growing. Thanks so much for the recipe Lois! Super excited to try these polish pickles and make them at home. Next time I head out to the market i’ll definitely have to grab up the ingredients to make this! I’ll report back with how everything goes. I’ve never added horseradish to a pickling before! Thanks again! Chemistry in cooking! This is essential information to a good cook. Thank you for talking process! My pleasure, Nancy; I’m glad it was helpful. I have 2 very large cukes left. Can I slice them in spears ,than ferment? If you can keep the spears submerged, I think it should work. I’ll let you know. Thanks for the advice. Hi is it suitable for vegetarian?